We'll embroider anything you want; clothes, afghans, hats, towels, blankets...anything. Bring in your item(s) and we'll help you pick out colors and designs. We can usually finish your project in 24 hours unless it is a large order. Call us at (608) 372-2171 for details. The children's department has baby gifts and accessories. We can embroider a personalized baby blanket with baby's name, birth date, and weight. Sizes start at newborn to size 16. Labels include Columbia, Nike, Little Me, Oshkosh, Levi, Union Bay, and Billabong. 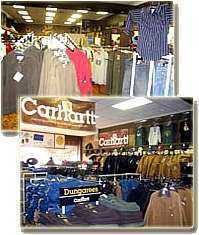 Our men's department features Carhartt, Under Armour, Pendleton, and Van Heusen. 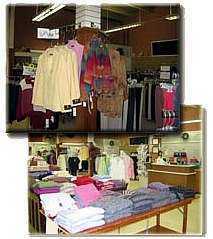 We carry suits and sports coats along with casual dress attire and work wear. You will always find the lowest priced Carhartt in the area at Tomah Cash Store. Our junior labels include Silver and Union Bay. We also offer embroidery for all apparel. See our available Carhartt T-Shirts. Page Summary: Tomah Cash Store offers mens clothing, womens clothing, formal dresses, childrens clothing, carhartt work clothes, purses, nurses uniforms, suits, sport coats, outerwear in La Crosse, Onalaska, Sparta, Tomah, Holmen, West Salem, Viroqua, Mauston, Black River Falls, Mondovi and surrounding Monroe County communities.